'Let's have a naughty sherry,' Surrey snob Sandra (Imelda Staunton) tells best friend Pamela (Josie Lawrence) as she prepares to host a retirement bash for her husband Mike (John Sessions). Little does she know her world is about to fall apart after she uncovers Mike and Pamela's affair. When her free-spirited sister Bif (a delightful Celia Imrie) picks up the pieces, Sandra learns to live a bit more dangerously than partaking in the odd tipple. 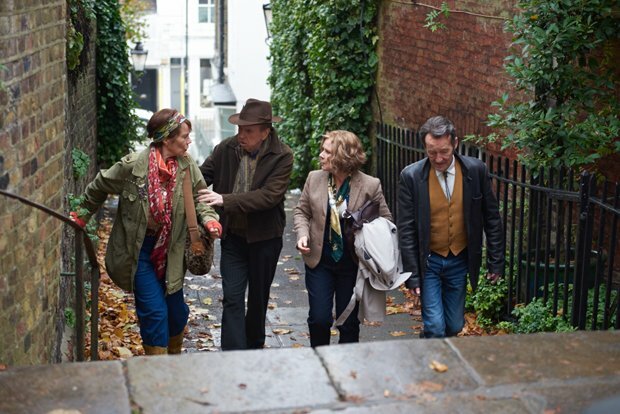 From director Richard Loncraine (Wimbledon), Finding Your Feet is pitched at the same crowd who flocked to the Marigold Hotel films – a mature audience, those who have perhaps lived their lives pretty sensibly and are looking to retire in style. Bif provides plenty of inspiration in how to do so on a budget; she's a ray of sunshine residing in a cosy council flat, merrily playing the field, pootling around town on her bicycle, taking dips in the ponds on Hampstead Heath, and dancing up a storm with similarly carefree pals played by Joanna Lumley, David Hayman and Timothy Spall. Cast adrift from her country pile and haughty social circle, Sandra's sour expression and terrible manners conceal a woman grieving for a future that was carefully mapped out; she's frightened for what will now become of her and too long in the tooth for radical change. Death and terminal illness are also part of a film that tries to see the bright side of life but that isn't oblivious to the pain. The humour and sadness co-exist agreeably, Staunton invests every line of dialogue with integrity and her character's romance with Spall's Charlie unfolds in a way that's endearingly, and credibly, cautious. The lessons loom a little large, while a jaunt to Italy feels outrageously unnecessary and ultimately bizarre. Sometimes it's hard not to cringe at their antics but the joie de vivre of these convention-defying pensioners is ultimately irresistible. It's a familiar blend, with just a dash of daring. General release from Fri 23 Feb.
Snobbish Sandra (Staunton) is disturbed to find that her husband Mike (Sessions) has been having an affair with best friend Pamela (Lawrence) but her free-spirited sister Bif (Imrie) helps her loosen up. Familiar but pleasant comedy-drama for mature audiences with a dash of daring. A great film. Both funny and sad. It’s not what I expected at all, a lot better in fact. I story is a lot more in depth and heart warming. Who says golden oldies can’t enjoy life. A true inspiration. Makes me want to get up and about and do something. Get out there and live!